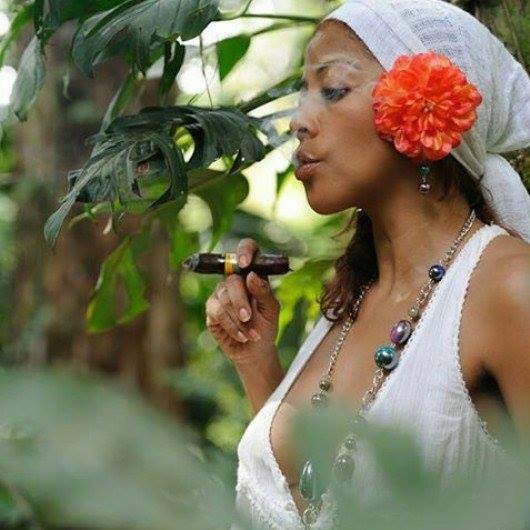 For the MB Cigar Ladies, today we meet Ana Maria. She is coming from Panama. She makes cigars and she smokes cigars of course. I started because my grandfather smoked and when I went to buy his tobacco I liked the smell when he smoked. The best place was in the five star Shloesse hotel in Tallinn Estonia and my second favorite place is alone on the beach in Panama. I cut the cigar with my teeth, like my grandfather did so. My world become full of peace and freedom. At 9 in the morning after the kid is off to school. When I smoke it opens a mental door to my universe of dreams and emotions. Today I prefer to think bad things and be positively surprised, than think good things and be disappointed. Thank you very much for spending your time with us, Ana Maria. Good ashes to you. 4 Responses to "“Ana Maria Cigars„"
Another great MB Cigar Lady!! Thanks Massimo……Ana is a lovely addition.